Remember what Netflix did to Blockbuster stores? What about how quickly the cell phone virtually eliminated the payphone? Sometimes technology seems to change literally overnight. Rapid change only happens because something was built that made the existing model obsolete. This is what might be happening to the putter as you know it. In golf, there is evolutionary technology and revolutionary. Evnroll is the revolutionary kind. Any golfer without this in their bag after today is, playing inferior technology. Evnroll should make all other designs obsolete. If I were to tell you that with Evnroll technology, no matter where on the face you hit the ball, it ends up in the same spot. Would you be intrigued? What if we told you that we saw it make balls actually curve back towards the hole when mishit. Well, that is exactly what our testers saw over and over again in our lab. Since the birth of golf, there have been tens of thousands of putter designs. Most come with little to no evidence that the advancement offered, whatever it happens to be, can actually lower your score. When you think about that, it’s kind of amazing. Millions of dollars of R&D and still very little data that suggests newer tech is better tech. Some putter grooves have been shown to produce forward roll more quickly than others. You’ve probably seen the videos. It sounds great, doesn’t it? But did you know that there’s absolutely no evidence to suggest that a ball that starts rolling faster goes in the hole more often? The reality is, most putter grooves don’t matter. So what makes the grooves on an Evnroll Putter any different? Let’s go back to what piqued our curiosity about this technology. Firstly, there was a video we saw detailing what the putter could do. What it showed was something you wouldn’t believe unless you saw it for yourself. Secondly, a few years ago we ran what we felt was and still is the most comprehensive independent head-to-head putter test and analysis done in the golf industry. We learned plenty. Sufficed to say that we’re 100% confident that many of you can absolutely lower your score by doing nothing more than changing putters. What we realized was that no matter what putter we tested, if it had PING TR grooves it almost always outperformed the putters that didn’t. Grooves don’t matter. The right grooves matter. The TR groove story isn’t about getting the ball rolling quickly, it’s about creating a consistent roll on every strike. We’ve seen TR grooves make a difference year after year after year. Golf equipment is an industry where legend often outweighs reality, but our testing constantly reminds us that marketing and mythology, no matter how strong, are NOT performance. There are, however, rare products that almost the day they are released seem to forever change the path of how golf is played. We’re talking about products driven by performance. We all remember what titanium did to the driver. You never went back to steel or wood. If you did you would be giving up real performance. Almost nobody disputes this. It is fact. We believe Evnroll putter technology can do for golfers on the green what titanium did on the tee box. As you can see from the graphic above, a putter that actually offers this type of technology could dramatically impact your ability to make more putts. Lucky for you, one does. As you’ll see below, we’ve tested it. This graphic isn’t just a fancy piece of marketing. This is real technology, and our test results suggest it results in fewer missed putts. This is what we call disruptive technology. 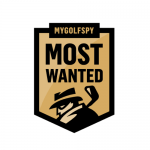 After seeing videos of this technology we quickly reached out to Evnroll putters and asked for samples to be sent to the MyGolfSpy Test Facility for further evaluation. Evnroll putters weren’t available in time for our 2016 Most Wanted Putter test, so to evaluate the effectiveness of this new technology, we put four Evnroll models up against the best performing putters from our recent 2016 putter test. Call it a head-to-head test against only the best. To find out how Guerin Rife’s new Evnroll putters perform, we put 4 models to the test against our 2016 Most Wanted Blade and 2016 Most Wanted Mallet putters. Here are the results. Evnroll models dominated the top 5 from 5 feet. Evnroll models finished 1st and 2nd from 10 feet. The Evnroll ER2 required 9 fewer putts to complete holes at the 10′ distance. At 20′ the PING Ketch Mid again finished on top, with 3 Evnroll models finishing within 3 putts. When we look at the number of putts per hole, and SG18, Evnroll putters filled the top 5, besting both of 2016’s Most Wanted Putters. 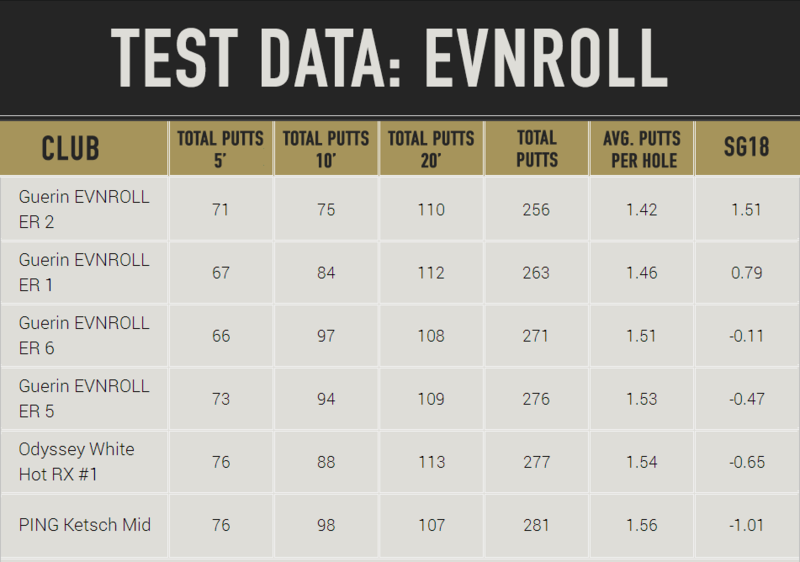 Not only did Evnroll technology outperform the best putter we have ever tested at MyGolfSpy, the data shows that the Evnroll technology outperformed it across each of the 4 models we tested. We believe the answer to Evnroll’s surprisingly strong showing lies in its grooves. Evnroll putters are the only putters with gearing technology, which helps steer the ball back to the target. This is a new frontier in putter design, and potentially the most significant putter technology since the Anser, and TR Grooves. That is elite company to say the least. Evnroll technology is the culmination of Guerin Rife’s long career, and the results suggest it’s nothing short of a masterpiece. This, so far in golf, is the perfect putter from grip to groove. I use p770 irons & g400 driver because of this website. I played 27 with the er2 yesterday and I’m a believer. Took at least 9 holes to get used to the distance control. Made buckets on the last 18 including an eagle that I swear curved into the hole. Question, I bought a used Evnroll ER-2 from my club that someone had traded in. It had the small Evnroll grip on it. I removed the grip to put the larger Evnroll grip on it and realized that there was a counter-balance weight in the end of shaft. Does anyone know if all of their putters come with a counter-balance weight in the end of the shaft or did the previous owner put it in? Thanks for your help, much appreciated……. The counter weights are installed by EVNROLL to dial in the swing weight. I’m confused MGS. Did MGS change their testing results/procedures from previous putter tests. In this test you show the ER2 at SG18 =1.51, yet in the 2017 most wanted blade you show the ER2 as SG18=0.96. Then you say it’s the higher ranked putter because of it’s SG18 of 1.51, but in your 2015 most wanted putter “overall winner” you show the Ping Cadence at SG18 = 2.07. What gives? Walter – I’m not from MGS, just a reader. The SG score is a RELATIVE scoring system, so it will change every time based on the putters it is being compared too. I wouldn’t worry about absolute value for that reason, but rather, where the score sits relative to the rest. Fabulous putters. I put the ER2 in the bag three months ago and have made more putts (and missed fewer short ones) than in a long time. Previous big improvement for me was with the Ketsch. The consistency of roll is uncanny; makes lag putts easy. Feedback is crisp, counterbalance and heavy head promote a rhythmic stroke. And the ball goes in the hole. Get one. It will make a difference. Just got fit for an ER5 and love it! It beat out a Ping Sigma Tyne and Scotty Future 5. All excellent putters but I was most consistent with the Evnroll. It is a sharpshooter from 15-25 feet and performed better than the other two at these distances in particular. The performance has carried over to the course and practice green. 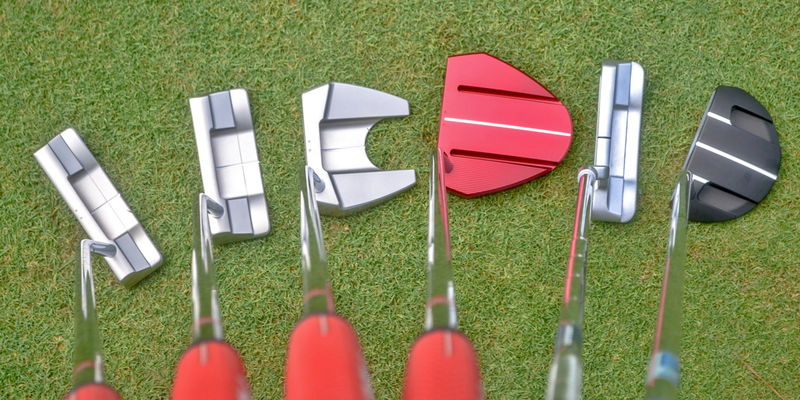 Debate the technology if you want these putters flat out perform as advertised. I dispute the comments about the hard feel. If you are using a good ball like a Pro V or Taylomade TP the feel is very soft without being mushy. Come on man, this is 2017. Why not left handed??? Bought an ER6 a few months ago. Have been playing golf for about 55 years. Age 66, handicap at 1.4 and I think this is the very best putter I have ever used. Needed to get used to it, but it is great. If you spend $400-$500 on a driver, why not a putter that is definitely great. Thanks for the previous info on the Evnroll. I spent about 45 minutes at PGASS today and really liked the ER2. It was a lot like my Odyssey Black Series #2 with a little more weight. Feel and sound were exactly what I like and hoped they would be. Not an oversized grip fan so that was an adjustment. Distance control was very uniform as advertised but being on a flat, indoor surface it is hard to know if the accuracy is significantly better than my current putter. I like it enough that I will put a watch on Ebay for one from someone looking to move on their next bigger/better for a less than retail price sometime in 2017. Fantastic testing, thanks so much MSG, you guys are the best. This is the only case where I could have seen a robot being used effectively to give us a really good test. Imagine using a robot to perfectly test straight strike vs 1/4″ miss to left/right vs 1/2″ miss to left/right and comparing the numbers. Theoretically the robot testing should remove any doubt, right? All of the strikes should end up being the exact same (repeatable) and really show off/disprove Evnflow’s technology. I’m with you guys on the rest of robot testing though, I think it to be fairly useless with ballstriking just due to angle of attack, lofts, lies, spin, etc. That is a great use for putter robot testing. problem is you still have to putt with it and that is where the rubber meets the road regarding how a product performs. If robot testing was the best way to test putters you can trust us that it would be the way we would test. Unfortunately it is not. “Gear effect” is the wrong phrase from a marketing perspective, because it is a physics term used to describe a concept of ball flight that is strictly an aerodynamic phenomenon. The bigger nerds are going to cry foul if those words are used. It’s brilliant. And it’s amazing that no one has thought of it before. Only a matter of time before everyone starts doing it. Thanks Karl. That is the best description of how the “gearing” works. I kept hearing it but nowhere did it say how or why it happened but your explanation makes total sense. Thank you. Hey Karl, that is an excellent description of how this technology works. Thanks for a layman’s explanation. Sorry, Karl, but gear effect is not an aerodynamic phenomenon. Rather, it is a function of the interaction between the ball and the club face, influenced by the distance between the club face and the club head’s center of mass. Now, the spin imparted to the ball by this interaction does have ramifications for the flight of the ball due to aerodynamic effects resulting from that spin, but gear effect is not in itself an aerodynamic phenomenon. And none of this has anything to do with putting. I’ll have to take your word for it. No lefty clubs offered. Lefty clubs ARE offered. Do some research. One thing that I don’t see is the test at 30′. 15-30′ are the most common distances for most golfers. And most golfers need the most help for those distances. I dont know the actual stats but 3 putts are very common for the average golfer over 20 feet, especially at 25-30 feet. And it concerns me that the envnroll starts getting worse as the distance increases. Showing the even longer distances will either show its worse or whatever and is very important to know about the characteristics of the putter versus other putters. If it supposedly turns the ball in towards the hole due to “gear” effect then it really should have shined at the longer distances because as the distances increase, the impact of minor mishits increases significantly. THe other items not indicated in this test were the green speeds and quality of the testers with respect to putting. For 10 and 20 foot putts (and even some 5 foot putts) different green speeds could have a very significant difference in the putter accuracy. I have two putters that I use a lot, an odyssey and a PING TR cadence. 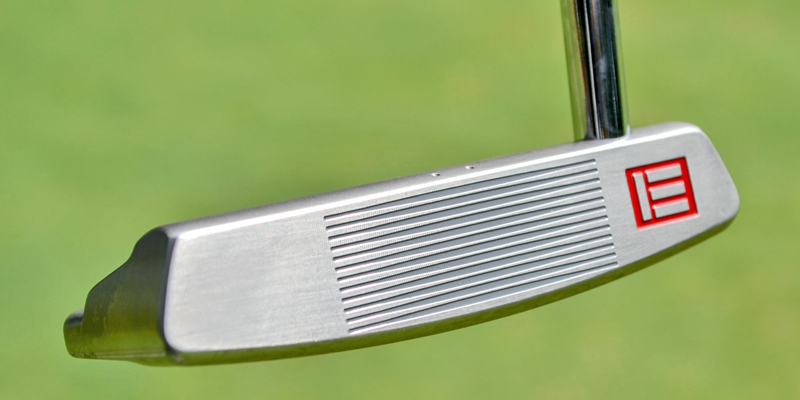 The odyssey is an older putter with a soft insert in the face to slow the impact down. The ping has the grooves and is a hard surface. What i’ve found is that on greens with very slick surfaces, over 5 feet, I’m much more consistent and putt way better with the odyssey as it slows the ball coming of the face so that even if I miss the longer putt it doesn’t go as far. The ping works much better on slower surfaces as it accelerates the ball off the face better but on the quick surfaces its harder to keep the ball close to the hole on longer putts. And i see that a lot with other putters and players. Take a green speed of 12-13 versus one of 7.5 and one can notice a significant difference in the results of the putts. And I think most resort courses will tell you that they keep the greens slower because the average golfer cannot putt well on fast surfaces and rounds are much slower because of more 4 putts, or more versus the slower speeds. So the green speed can dramatically change the tests and comparisons. At least mentioning what speed the greens were for the tests would have been useful. Secondly, some indication of the handicapps of each of the testers would have also been useful. Were they all 10-20 handicap or more, or mostly under 10 handicap. Were they all under 5 handicap. THere’s a lot of difference in most golfers putting ability between a 15-20 handicap versus a 0-5 handicap. Having some idea of the handicaps of the testers will give more credability to the accuracy and meaningfulness of the test. Not true. For longer putts the most important thing is speed, and proper line as well, but alignment and aiming issues can really affect the putt sinking or not. The human factory is much greater at long distances vs shorter distances where most people can sink a putt if properly stroke on the putter face. I have to agree with many of the nay-sayers here whom are questioning the claim of gear effect of this putter. I am surprised, as a so called independent tester, you folks yourself did not call out Envroll for marketing hype of this product. Gear effect is an aerodynamic producted effect and not a ground produced effect. It takes aerodynamically produced forces to make a golf ball curve. To make a ball curve, without the effect of gravity, can only be produced with aero force. If the ball is curving on its way to the hole then please explain the physics of why the ball is curving. What forces are in play that are making the ball curve? Do you have any time-lapse photos taking during your testing of this putter than can show your readers that in fact this putter produces gear effect related curvature of the golf ball? Sorry to say but this claim is bogus as it defies the laws of physics. We see the same thing in our test facility. Sorry MGS, no gear effect to be seen on these videos. And did you watch the videos, MGS? Three putts hit on the last video, with no visual indication of where those putts were hit from. Not exactly compelling data. Glad to see a robot in the test (and mention of robot testing in a couple other articles recently). However as you have pointed out MGS, you can set up a robot to hit a ball however you’d like. So which is it–robots good, or robots bad? Just depends on who is paying you advertising dollars, possibly? So robot good for a couple things, robot not so good for finding the overall performance of a product in real golfers hands. So Art, what would you like to come off like passively aggressive about next and have me answer? They can argue semantics all they want, but there are simple robot test results showing the effectiveness of this design like you have shown. I’m not sure what they are arguing about here. If people are so skeptical of everything, then might as well not read anything. Jack, skepticism is a critical trait in the scientific community. Thank you for the compliment! My apologies MGS, I certainly didn’t want to be passive in my assertion that you seem to use information gathered from robots with a certain degree of discrimination, bias, and hypocrisy. I bought the ER1 as the only one in the shop here in Australia. It’s quite an expensive putter so was not keen to purchase online without having used it. In the store it felt great to use but their putting surface was not great as had a bad roll in the surface which was difficult to see. That said I was still sold just by how nicely the ball consistently came off the face and rolled. I then got the chance to use it for the first time yesterday in a round. Its only one round and I actually played quite badly (weekend hacker trying to get better) overall but putted well. 5 puts less than my previous round just 3 days earlier on the same course and the rounds were within one shot of each other. My earlier round I played around the course much better and thought I had putted well so to get 5 puts less when I was playing quite badly saved yesterdays round IMO. Overall after just one use I am convinced the evnroll is AMAZING. I had 3 clear miss-hits on the toe of the putter that all went in when normally they pull to the left. They only just made it but they made it! Putted extremely well under 20 foot – Almost all day if I missed from this distance it was a very simple tap in. Being a weekend hacker with my old putter at least a few times a round I would get this wrong enough that I would leave it too far away and miss the next put at least once. 2 times I was more than 20 foot away and both times I over-hit the puts considerably. I think this will just take a little time to get used to compared to my previous putter. The ball comes off the face so well in comparison that it goes quite fast when I give it a bit bigger swing. I am sure I can sort this out quickly with a bit of practice. Overall I was very hesitant to fork over almost $500 AUD for a putter but after just one round I am totally convinced it is worth it and I will be using this putter for the next 10 years easily unless there is a new better technology that comes along. We (10 yr old son) bought one last month after talking to someone and comparing other putters with a fitter. Will agree that his distance control has improved. The roll is true. Ok I heard about the New Evn roll putter and stopped in to check it out today, Jamie helped me and was very knowledgeable and helpful regarding putters ended up getting the ER 1 putter. I have been rolling it into the center of my practice green quite accurate only missed 1 out of 20 because I did not hit it hard other wise it would have gone in as well. Using the yes putter now its fine. But if the ER 1 helps knock off a few strokes as they say drive for show putt for dough. Ask for Jamie if needing help getting fitted. he will do you right. PGA SS Shenandoah Texas. As others have mentioned – no lefty options…? No future? That’s going a bit far. Lefties are not a big part of the market. Sorry bud. It costs a lot to create a left model and for a small company like they are it’s wiser to make sure the demand is there then spending money to sell to lefties. You have to pick and choose and sacrifice when you have a limited budget. …greater distances should exaggerate the deviations caused by normal putter faces. I’ve read thru all the positive and negative comments but I will have to say that a very similar design on the face of my Heavy putter does in fact improve performance. It does also soften the strike which would require some adjustment and where “standard” face or shallow milled face putters seem to meander on past on a breaking slick downhiller, this putter seems to have a much more consistent distance control capability that stays near the hole. I removed the original grip-weighted shaft and replaced it with a conventional shaft and grip which gives it a nice heavy head feel (400 g mid-weight head face-balanced ) which translates to a smoother stroke instead of a hit! Point is, a tightly grooved face does impart truer roll, believe it or not, I’ve seen it for myself and has made me a believer and a better putter. As for correcting a putt, I’ve not seen that, but the ball doesn’t seem to move as far off line on a mis-hit. I bought the ER2 the first day it was available (came across it by accident). Have several rounds in now with it and it is, without a doubt the best putter I have ever used. I read these comments about people hung up on the tester saying “it curved the ball”. I dont find that. It is designed with varying depth grooves to promote the same distance putt across the face. It has helped me big time. If people would take the time to go to the website and understand that the two dots on the top of the head are intended to help guide you on left and right breakers. Anyhow, dont try it if you dont want, but my ER2 is not coming out of my bag any time soon, that is for sure. Have a great weekend. I have never read testing or seen comparising made with Bobby Grace putters on your website. The amount of face technology in his putters is unmatched and consistency of distance unbeatable. $329…I don’t think so. Too expensive. I’ll wait a few years when it’s $99. Would you spend $329 on a driver that you use about 8 times a round? I bought an ER1 and its the best money I have ever spent……. Nothing beats a Scotty!! You can hang on to it for 10 years and it might be worth more than you paid for it. Only club that maintains its value. At least as far as I know. Gold is a better investment!!! Buying a golf club for resale value is the single worst reason to buy it. This could be the best putter of all time but no one will pay 329 for it. Why not? People regularly spend more for putters that do less for them. Wouldn’t it make sense to try this instead of always spending $$$ on Camerons? Looks like another Ping copy. Also, I’ll never understand how only a test with only 10 participants is acceptable these days. I know it’s “industry standard” to have 10-20 people in these type of tests…. BUT WHY????? The top putter completed it’s “track” in approximately 9% fewer putts than the last place finisher. I would have to believe that number is reduced below 5% or less if you have 100 plus users. You can’t tell me it’s too difficult to have 100 users for the test, it simply just takes longer. There’s no way you’d have trouble finding 100 people of all skill types. Even if you wanted to limit it to single digit handicaps, I bet you’d find a bunch in whatever area you went to. Also, I was able to try 2 of these models yesterday and can say the one thing I came away with is they felt very weak off the face. I tried several other putters before EVNRoll and the ball seemed to come off the face a little better on all others. This leads me to believe that they would be great putters for fast greens, but would take a lot of getting used to on slow greens. I thought they were okay overall, but nothing special. I still putted much better with the Ketsch mid than anything else I’ve tried… which brings up how disappointed I am that the Ping Vault Oslo and Bergen are not as good as the Ketsch. And to be honest, the Karsten TR 1955 putters feel better to me than the Vault version. I know this isn’t a Ping thread, but I’m definitely disappointed. What a bunch of trolls. How about instead of screaming “the world is flat!” From your soapbox, try one out, see if there’s a tangible difference…. If it doesn’t work for you then, feel free to walk off the edge of the earth. We aren’t “trolls” just other golfers. No one “screamed” we are actually typing. We just found this particular review a little hyped and the “Gearing” claim is what many of us are put off by., “steer the ball back to the target”, in particular. Tony is a big boy with a big website. He can handle us disagreeing with him or challenging his claims politely like a gentleman. This is my favorite golf site and Tony is my favorite author on here. I suspect we’d get along swimmingly in real life. This one was a little high on the hype level. I suspect it’s quite possibly because the team saw some great results and got excited. Nothing more, nothing less. I tend to think putters are a very personal thing. In the end the only thing that really matters is squaring up the face while having the proper aim point and speed. How people get there and what makes the. Feel confident to do it varies greatly. My grandfather shot in the 70s well into his 80s. He was a great putter and did it with an old Bullseye, which is arguably one of the least forgiving putters out there. In the end it didn’t matter because he had game and he had been using that same putter so long that he knew exactly how to control the distance. I was very intrigued as well. I went and tested them at PGA SS and to be honest, the lack of good feel trumped benefit that the technology could provide. I stroked the ER1 and ER2. After about 25 minutes there were occasions where I may have sensed/noticed the technology working but I wasn’t sure. Definitely not bad performance but extremely similar to the Anser TR line from last year (the copper colored putters) Distance control was good. At the end of the day I just couldn’t deal with the blocky “knock” feel off every roll. Kinda feel like wood or as if i was stroking the putt with a wrench or something “non-putter”. No sweetness to the impact that I look for when dropping over $300. The Bettinardi Kuchar 35″ model has this sweetness as did the original black cameron Golo from 6 years ago. The EVNROLL is not this nice at impact. I’ll revisit because i like the shape of the ER2 and the performance was there. Sometimes acoustics in a room can vary impression. My point was that it felt hard to me. I’ll give it another try. Bought the ER6 at our local PGA Superstore last week, took it out straight away and won the member guest at my club! Already made my $359 back and more! Hahahaha even my girlfriend is getting jealous at the affection I show for this thing. Well I revisited the ER2 at my PGA Store. This time I brought in 2 ProV1x golf balls and was shocked how much more I liked this putter when not using the TopFlite balls scattered on the practice green. The Er2 was something special in my hands. And the tech works. You can see it straight away. I needed a 35″ putter and they only had 1 left and it looked less than perfect. It had banged against other putters on the demo floor but the top-line was still in decent shape. This is a $350 putter and I bought a tarnished unit at no discount.. It was that impressive. Unfortunately I had a money game the next day and couldn’t wait for them to order a new one. So happy with the performance. So I must say I was hasty in my review above regarding the feel being “off”. It’s quality thru and thru. A bit of hyping in the article, and more than many are accustomed to seeing out of MGS. I guess it worked given the server crash and some posts here about buying. I will say this. Having gamed several Rife’s in the past, my opinion is that grooves do put a smoother roll on the ball, and Rife himself has an eye for a clean design (even if the shapes are highly derivative/copies). Rife’s “game” is grooves on a milled metal face. If he truly has improved on those grooves, then this putter will perform. I wish he had a center shafted half blade/mallet in line with something like the Rife Uno. That’s about the perfect size for a center shafted putter. Rife has made center shafted putters before, so I’m a little surprised they didn’t initially release one. Hopefully they will soon. There is a bit of a cautionary tale when it comes to Rife. This is about his third (maybe fourth?) putter company. The putters seem to work well, but something about his business models or investors seem a bit off. I know the golf business is very tough, but this company could be the next failed Rife venture in 18-24 months. I hate putters with offset, and that is the only thing they offer, so even if it gets more consistent distance and curves balls towards targets I’d never feel comfortable using it, nor aligning it. I’m certainly not going to spend $330-$380+ on a putter I don’t like the look of at setup. If they ever come out with a center-shafted non-offset model, and it was a cheaper price I might give them a look. Claims are just that, claims. Our job is to put those claims to the test. Which we did. Tonico: the founder is the same guy who started RIFE putters, which we represent. That’s weird, the Nike Method Origin has the exact claim with their roll on mishits. 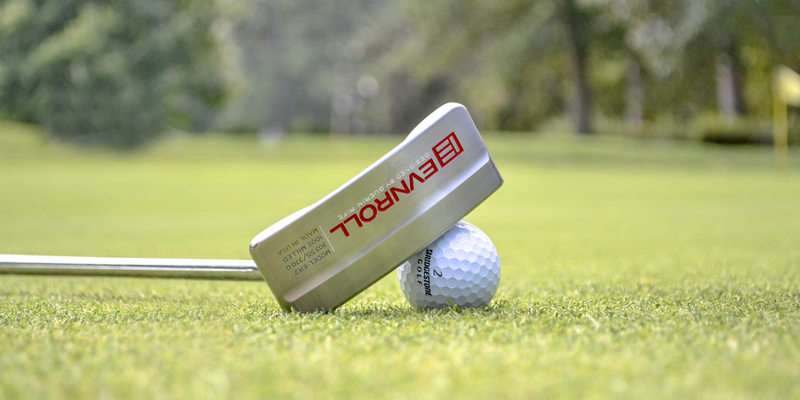 Your test results belie the notion that the Evnroll putters are capable of imparting hook/slice spin. If they did so, I would have expected to see far more missed putts. Why has the RX1 a better result in this test compared to the blade vs. mallet test when looking at SG18 ? I bought the ER2 on eBay for $279…am waiting for delivery..I have complete trust in the testers on this site as I’ve not been steered in the wrong direction yet. When it comes to putters I listen..the Carbon that was tested has been in my bag since last fall and I’ve done very well in tournament play where I live because of it…and I’m a custom putter guy..if the stats bear out with the ER2 then I will be even happier! By the way the Snell golf ball does everything mygolfspy has claimed..and Dean Snell is a class act to boot!! Keep up the great research guys!! Was thinkjng about bringing guerin putters to the area. May have to after this. The comparison graphic shown above is misleading… wait, no – it’s just plain wrong. A plain-face putter (one w/o grooves) doesn’t make the ball come off the face at an angle just because the contact point is not at the center of the face, at the so-called “sweet spot”. As long as the face is square to the swing path at contact the ball will come off the face on a path that is perpendicular to the face. If the swing path and the face are not perpendicular the ball starts offline to the extent of their divergence. Because the forces involved in putting are so low, and the ball is rolling, not flying through the air, the location of the center of mass of the head of the putter has virtually no effect on the path of the ball. There is no “gear effect” in the interaction of the face of the putter and the ball because the club head does not rotate as a result of an offset between the contact point on the club face and the position of the center of mass. Neither is there any change in the amount of force acting on the ball due to the change in contact area which results from the changing width of the grooves—and if anyone disagrees, I challenge them to demonstrate the physical principles which would make it so. If the hardness of the face varied outward from the center, or “sweet spot”, then contact in an area where the face was substantially softer would result in less energy transfer, but the difference in hardness would have to be quite noticeable. Putting is not as mysterious as most people make it out to be. It’s difficult, yes, because it requires a precise motion which is not easy to consistently achieve, to make contact a ball which has a variable surface (the dimples), across an uneven, living surface (the green) which has slope, grain, and inconsistent surface characteristics due to moisture content, in an outdoor environment with factors such as wind coming into play. Using a putter whose combination of mass, length, and other physical characteristics suits your swing is the most important first step in putting well. A putter that fits you well, that feels “right” will allow you to deliver more consistent contact more often, whatever the geometry of your swing, to start the ball on the intended line. Of course, choosing the right line, and speed, is a matter of reading the green, which is a skill which comes only with practice—lots and lots of practice. Your comments are on the money. A putter has to feel good and inspire confidence. Everything else is between the ears. I suppose no one wants to listen to the fact that we have proven this to not be true over and over and over again. Proven what not to be true? I am unclear as to the point you are trying to make with that statement. I am a small club maker/fitter and what I find in common with the Evnroll putter and a driver are the “scorelines” and the gear effect that is common with some of the drivers. It took quite a few years to apply this simple thought to a putter. It might be a stretch to think that this will be a end all to finding the perfect putter, but the concept is worth noting. Does anyone have a discount code for ordering online? i read the review and the results are impressive! Is there a working website? Special discount for mgs readers? So the gearing effect happens at impact, correct? The ball doesn’t actually curve back while rolling? Also, how much does the force of the stroke affect the amount of “correction”? Does fast downhill putt get corrected less than slow uphill putt? I’m curious why the other big putter brands haven’t copied their technology if it is in fact producing these sort of results? I’m guessing they probably have a patent on it and it can’t be copied. I bet the people at Ping and Odyssey won’t be too far behind with bringing out something similar to match it if they can. Ping did come out with Variable Depth Grooves on the Ketsch……and that is what My Golf Spy tested the Evnrolls against. ^^^ thinks $300+ for a putter you use every almost every hole is high, but probably willing to spend $400+ on a driver that is only used 7-12 times a round if that…..priorities LOL!!! That’s ridiculous. They will be out of business in less than five years. Just like PXG… and they’ve been out of business for two years. You might want to look at your frugality issues. Don’t be cheap if it brings you pleasure… or better golf scores. Very interested in these, do you know if they are in any retail stores? Or if they are coming to any? Why do you think the EV6 did relatively poorly at 10ft when it had the best 5 and 20ft scores? I prefer a mallet but that seemed inconsistent to me. After checking out the a little more from their website, it’s interesting that one of the byproducts seems to be that the putt distance is reduced from a standard putter, even when struck in the face center. Essentially, they have engineered a sweet spot hit to react like a mishit as far as distance is concerned. Logic would then tell you that you’d have to put a stronger stroke on this putter than a standard putter. I wonder if anyone who has played these has experience. Did you leave balls short for a while until you adjusted? Wouldn’t a harder stroke introduce more error in to the putting stroke? I have the ER6 and yes, I know I have to hit the ball a bit harder. I used to roll my misses a foot or two past the hole. With the Evnroll ER6 my misses are now stopping right next to the hole, if they don’t drop in. Sure it takes a bit of getting used to, but is well worth the effort. Am I right in seeing that there are no left handed options currently available? Is there a plan to? Since their website is down and they are working hard on getting it back up, here is a link to their Instagram site so you can start getting some ideas of the product and their technology. When you say the ball curves back toward the target you really damage your credibility. I also want the toe of my putter “dead” for putting on super fast greens. We damage our credibility by telling you what we observed in our testing? That’s an interesting position. I would think it would be damaging to tell you something other than what happened. We certainly suggest you try an Evnroll for yourself. They’re available at PGA Tour Superstore. You’ll note that the grooves do not run the full width of the face, so if for some strange reason you feel you benefit from a dead toe, I suspect that would still be true. How was this observed? what is “Gearing” how does it work? How does the putter “know” where the target is? Also why in the world would I be daft enough to walk into a chain megastore and plunk down a huge amount of $$ on something I wasn’t even fit for? As far as my “some strange reason for wanting it dead off the toe. I learned this from hacks like Mickelson and Nicklaus. “After watching Phil Mickelson putt a 25-footer off the 9th green on Friday at the Masters, I think we’d all be wise to remind ourselves of Jack Nicklaus’ secret for putting down the speedy slopes at Augusta National. Where and when will these be available in the UK? Ha! No lefty option for us. Blah, blah, blah bottom line, gotta make money, blah, blah. Maybe the lefties should kneel on the first tee ala kapernick for the lack of respect toward the south paws. I see from the data it says Guerin Evnroll, does he not make Guerin putters anymore? Really like the tech, especially with some real world data backing it. BUT! my favorite part is that the putter doesn’t look like a welding project- petty to focus on looks, but hard not to some times. I do wonder if the design allows for the putter to impart different spin on the ball depending on where on the face the ball is struck. Is there a retailer in Ireland ??? wonder if anyone on tour is using it yet? I know at least one European tour player is using it. Wow, Looks like I’m going to be doing some research on these. Are the available at any stores for on-site testing? Tried to go to their website, but get an error – any idea how to contact them? Probably best if they made sure evnroll.com was up before posting this. It was up when posted, too much traffic crashed the site. I have tested these at PGA SS, they are great putters. It was. Traffic from this test is the reason why it isn’t right now. The traffic from this article to their site has caused some server issues. We have contacted them and let them know. At least their design and innovative skills are better than their website skills. It is hard to believe for many golfers when traditionally they have been marketed too with little to no performance that backs up all the previous claims. It is rare to see a product perform like this. Once they try it they will see for themselves. Hmmm…This just sounds too good to be true. Is there video of this you would share? I’m most interested in the 5 and 10 foot results (my misses). Now if I could just find someone around here who HAS Guerin putters…. Pardon me? Did you say the both you and your testers saw the putter make the ball actually curve back toward the hole when mishit? Over and over again?? That would indeed be truly amazing. It would also violate the laws of physics. IMO, you have just taken putter hype to new levels. If this review is real and not some kind of joke, your credibility has taken a hit with me. I honestly couldn’t read any further after the “curve back toward the hole” comment. Why not save this article for April 1? We would love to have you to our facility, this way you can see the test for yourself. Feel free to contact us at [email protected] if you would like to visit. Don’t slam your shut too soon. It is possible if different spits on the putter face impart different forces on the ball because of the faces design. Do you know the answer to that? My answer would be — for now. Once the PGA tour sees something that will help players putt better they like to ban it. Interesting that the Ketsch still did better at 20 feet. This make me wonder if the EVNROLL putters “over-correct” slightly on longer putts. You would think most of the curvature back toward center occurs in the first foot or 2 followed by a somewhat straight ball, but there has to be some influence to the side as well. I’m really looking forward to trying these out and I’m sure the slight finish behind Ketsch from 20 feet will probably not even be noticeable (maybe one stroke in 20 rounds?) and it may make up for it from closer to the hole it seems. I’m guessing a lot of pros aren’t using this yet because they have more consistent putting strokes than us amateurs and care a lot more about feel. Although, that may be changing with Dustin Johnson switching to a mallet and winning immediately.